And some associated ramblings rather characteristic of this blog’s author. I swear, I always have so much to say throughout the week. Then Wednesday comes along, and something happens. Blinking cursor, blinking cursor, blinking cursor, no writing. There’s a tournament this weekend in Austin. The Texas State Championships 2012 is taking place this Saturday, April 21st. Not being able to stomach the idea of ‘being square,’ I will ‘be there.’ Actually, I just, only moments ago, finished registering for purple belt (170 through 184.9 lbs) and the purple belt absolute.1 That, I guess, is the good news. The bad news? I spent all last week at home, some five-hour drive south of Austin, eating mountain upon mountain of garbage while simultaneously forgoing even the slightest bit of exercise. As a conservative estimate, I pegged my probability of dying from a goddamn acute myocardial infarction brought on by “Tuesday Class Overexertion” at approximately 13%.2 I mean, I obviously survived – otherwise I wouldn’t be here writing to you, my audience. But that particular probability really confounded matters further by perfectly playing into what the DSM would characterize as Stage IV triskadekaphobia. And for those of you who do not have an innate suspicion for the number thirteen, I have some bad news for you: 13s are the end result of a day-long surgery performed by “doctors,” who show up at your house unannounced and successfully manage to separate the freakish, conjoined twin, ‘B,’ that you keep behind a perimeter of electrified chicken-wire in your basement. Be suspicious of them. They deserve their revenge. And they are coming for it. I…do not know where that came from.3 That was unusually dark, maybe even for me. Maybe. Today, I am just sore from yesterday’s class, and a little loathe to write anything that will require even mental exertion. I’ll be sure to put the tape of my matches on the blog as soon as possible. Hopefully my record, since I began competing in the purple belt divisions, will remain unblemished (minus that one time I got strangled unconscious). By the way, did anyone catch the match between Rodolfo Vieira and Rafael Lovato Jr. last year at the Mundials? I saw the match a week ago or so, and was completely flabbergasted. To the extent that I am qualified to judge, I am not sure if I have seen a more resounding expression of positively immaculate timing. It’s all the more daunting to realize that Vieira is doing this to some of the best in the world. Thanks for reading. I’ll update about the tournament as soon as I can. 1. For the first time ever, I actually registered for the purple belt division without having to beg anybody to let me do it! Pretty exciting. 3. I hate ending my sentences in prepositions. 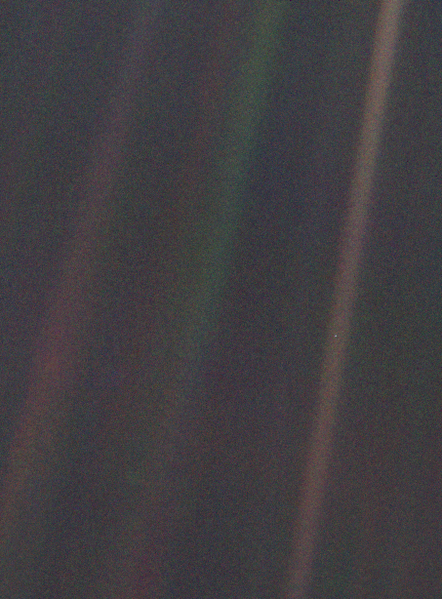 Below is a photo of the planet Earth from 3.7 billion miles away. The earth is a very small stage in a vast cosmic arena. Think of the rivers of blood spilled by all those generals and emperors so that in glory and in triumph they could become the momentary masters of a fraction of a dot. Think of the endless cruelties visited by the inhabitants of one corner of the dot on scarcely distinguishable inhabitants of some other corner of the dot. How frequent their misunderstandings, how eager they are to kill one another, how fervent their hatreds. Our posturings, our imaged self-importance, the delusion that we have some privilege position in the universe, are challenged by this point of pale light. Brazilian Jiu-Jitsu competitions are something, in the strictest sense, that we do alone. To believe that my modest gains and achievements were something I accomplished strictly by myself, however, is simply nonsense. My training – technical instruction, positional sparring, self-defense, and all that lovely rolling – is done with a team. We test, we sharpen one another. Without a team, there is no training. Without a team, there is nothing. Particularly, I would like to extend my sincerest gratitude toward Ian, Taesung, Tantrik (congratulations on the blue belt), Vidush, Phoenix, Joseph, Roy, Roli, Derek, Seth, Jordan, Dan, Jim (Captain America), and Donald.2 Whatever I do, it is always with your collective help. So, the documentary is pretty self-explanatory. And I’m not sure what to say about it, other than listening to what these young men had to say about their mental states, what they were thinking while competing MELTED my face, exploded my brain, and, worst of all, made me reticent to call myself a man. I mean…LOOK at that crazy kid’s face. Look at it! While I would probably not advocate a person ever sincerely espousing opinions I have enclosed below, it is interesting (frightening?) to hear what the toughest among us are thinking as they compete. 19 year-old: They’re trying to destroy me, trying to destroy me. And I have the right to kill them. He’s afraid of what I’m going to do to him in front of his parents, in front of his family. I think wrestling is a good sport because you can break somebody. You can break their spirit – you know, make ’em be a different person for the rest of their life. Monster B: Make him feel like a fool. Break his spirit. Trash him. Pick him up by the singlet on one side, and his backside, just like a little kid, and throw him out the door. Aaand there is literally several dozen more quotes like that which, when you hear them, make you wonder how those Iowa coaches broke that many sadists and sociopaths out of the most dangerous mental asylums in the United States, and why these patients are so damn good at wrestling. Anyway. It’s an interesting watch, and worth your time. Thanks for reading. 2. Afraid of forgetting somebody, I started with the lowest belt color and worked my way up.